Dumb Cane (Dieffenbachia) care is easy when you know exactly what to do. 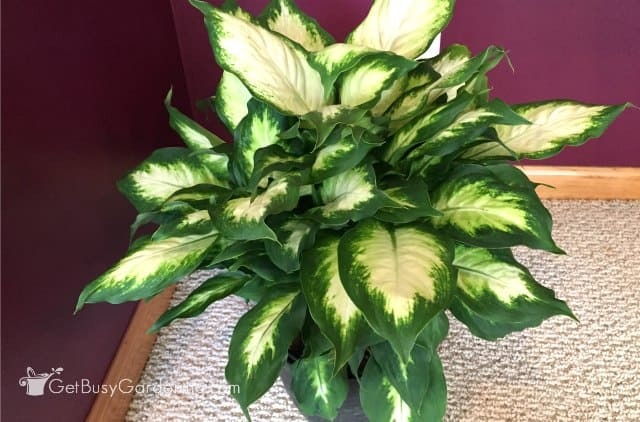 In this post, I’ll give you lots of information about the plant – including the name, different dieffenbachia types, toxicity, common problems, and FAQs. I’ll also show you exactly how to care for a dumb cane plant. I love being surrounded by plants all year round, and that’s one reason why I have a large collection of houseplants. I like to grow a variety of plants, but I especially appreciate easy-to-grow houseplants. Well guess what, the dumb cane houseplant (Dieffenbachia) is one of the easiest plants to grow indoors! 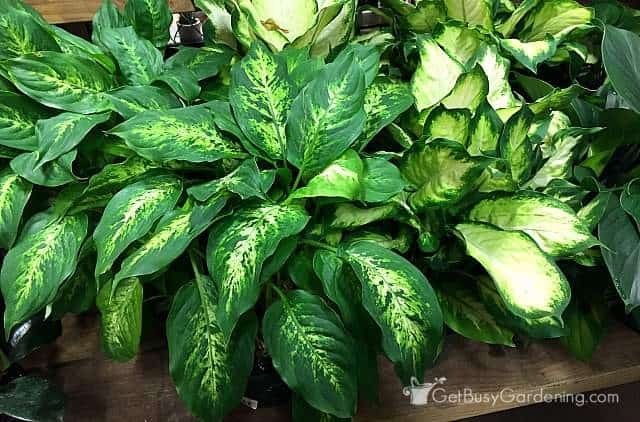 It’s no mystery why dumb cane plants are one of the most common houseplants you see for sale at garden centers and big box stores. They are extremely tolerant of any indoor environment, and are super easy to grow (heck, they practically take care of themselves). Even though dieffenbachia care isn’t difficult, it’s definitely important to know the growing requirements for your plant in order to keep it alive and thriving. This comprehensive guide will show you exactly how to grow dieffenbachia. 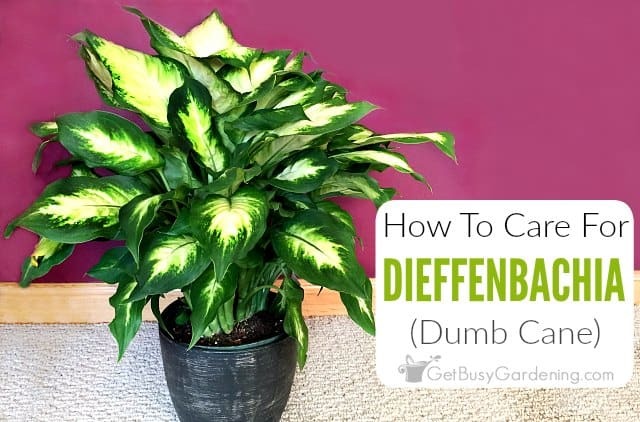 What Is Dieffenbachia (Dumb Cane) Plant? 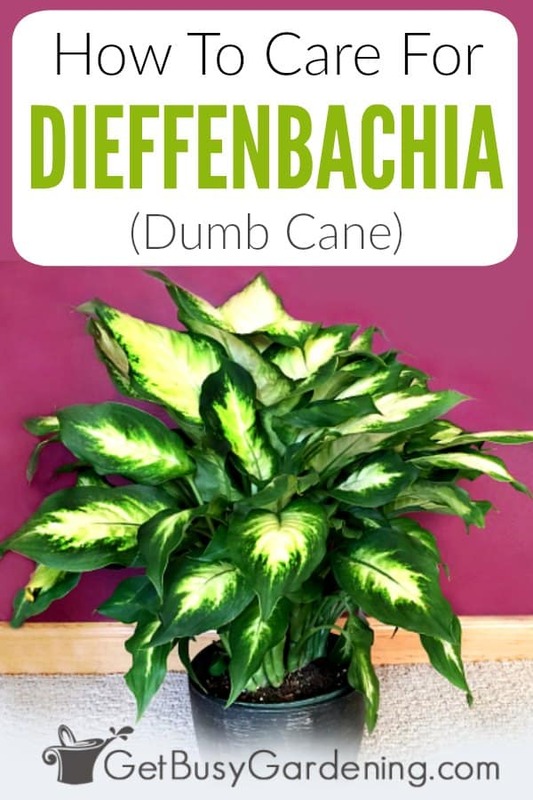 Is The Name Dumb Cane Or Dieffenbachia? What’s With The Weird Dieffenbachia Common Name? Why are the leaves on my dieffenbachia turning yellow? Why is my dieffenbachia drooping? How often should I water my dieffenbachia plant? Can you cut back a dieffenbachia? Why are the tips of my dieffenbachia plant turning brown? Is the dieffenbachia dumb cane plant poisonous? Dieffenbachia (aka Dumb Cane) is a very common tropical indoor plant that is prized for it’s beautiful foliage and easy care requirements. Though they originate from the tropics, they make excellent houseplants because they can easily adapt to growing indoors. Both! (or should I say “either”?) Dieffenbachia is the scientific name for the plant, and Dumb Cane is the common name. So you can use whichever name you prefer (and I will be using these two names interchangeably throughout this post). Dumb cane is a really weird name for a plant, right? Well, there’s a reason for that funny name! The dumb cane got it’s name because there is a chemical in the sap that can cause temporary loss of speech if any part of the plant is chewed or eaten. “Dumb” is an old slang term that was used to describe someone who can’t talk (it’s mean, I know!). There are lots of different species and cultivars out there these days, and they are all gorgeous! Dumb canes can live for many years, and some varieties can grow to be several feet tall, creating a very large floor plants. Some dieffenbachia varieties have dark green leaves, many with white spotting. 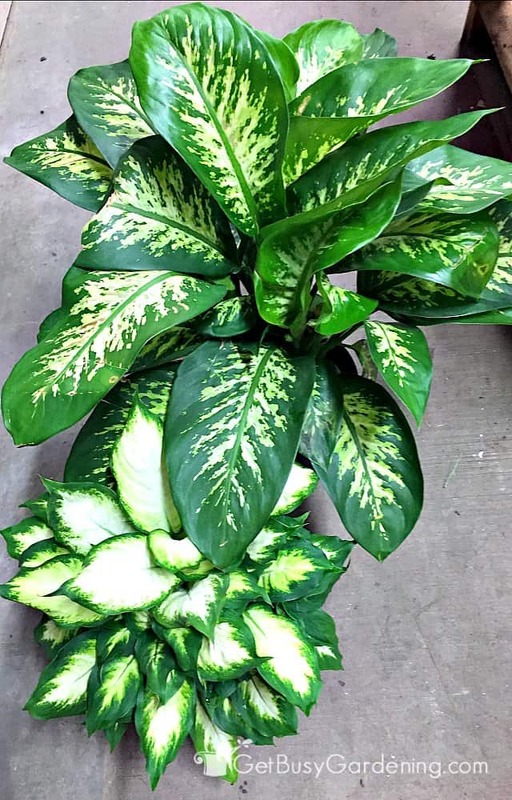 Variegated dieffenbachia are even more stunning, and some have bright green or almost white leaves with dark edges. Common dieffenbachia plant types or names you may come across are seguine, compacta, maculata, golden sunset, camilla (aka camille), amoena plant. Here’s a great list of some of the most common dumb cane varieties. The good news is that, no matter which type you have, dieffenbachia care is the same for all! Yes, the dieffenbachia plant is poisonous. According to the ASPCA website, dieffenbachia is toxic to cats and dogs. So, if you have pets or small children around, then it’s best to treat dumb cane as you would any of your other poisonous houseplants, and keep it out of reach. Otherwise, check out my list of pet friendly houseplants instead. Yes, but it’s not very common for a dumb cane houseplant to bloom indoors. They need the perfect growing conditions in order to flower, and it can be difficult to get it just right in the average home. Though dumb cane flowers are pretty (and fun to see! ), they’re small and insignificant, so it’s not a huge asset to the plant. That’s why they’re grown more for the beautiful foliage than for the flowers. Yes, they love being outside during the summer. They could even be grown in your shade garden if you live in a warm climate. You can move your dieffenbachia outdoors during the summer, and they will flourish. They won’t tolerate the cold at all though, so be sure to move them back inside before the temperature gets below 60F. Like I said, it can be grown outdoors in your shade garden, but must be protected from cold there too. In order to bloom, dieffenbachia houseplants need a lot of bright, indirect light. However, they will not tolerate direct sunlight. So it can be a difficult balance to give them the perfect amount of light in order to get them to bloom. Putting them next to a sunny window where they will get lots of natural light (but no direct sun) is the ideal location for them. If you can’t give them enough natural light, you could always add a grow light. Feeding also encourages flowers. So, if you really want to see if you can get your dumb cane to bloom, then be sure to feed it. Follow the directions below for fertilizing dumb cane plants. The number one cause of dieffenbachia houseplant death is overwatering!! <dramatic pause> Ok, ok, I just made that up to sound cool, I don’t know if there are any actual stats about the top causes of dumb cane death. All kidding aside, overwatering really is the main thing you need to worry about when growing this plant. Proper watering is a crucial part of dieffenbachia care, and consistent overwatering will definitely kill your plant. Just make sure you check the soil before watering by sticking your finger about an inch into the dirt. You want to allow the soil to dry out a bit between watering, but never become completely bone dry. Once the soil no longer feels damp, then it’s time to water. To water your dieffenbachia, give it a good soaking until the water starts to run out of the drainage holes. Then allow the excess to drain from the pot before putting it back on the plant tray. Never allow your plant to sit in water. If you struggle with knowing when to water your plants, then I recommend getting a soil moisture gauge. It will allow you monitor the moisture level, and help ensure you’re watering your plant at the right time. Dumb cane plants also really like humidity, but they will adapt to growing without it. However, if you struggle with keeping your dumb cane healthy, and it constantly has brown leaves, tips or edges, then try running a humidifier near the plant to see if that fixes problem. Dumb cane are perfect low light houseplants because they actually don’t like it when they get too much light, especially direct sunlight. Direct sun will cause their leaves to fade or burn. On the other hand, if the room is too dark, they’ll quickly grow tall and leggy. A spot next to a sunny window, or where it gets filtered sun through a curtain would be perfect. Just be sure to keep them out of the window so they don’t accidentally get too much sun. If you start to notice the leaves are fading or turning brown, then move it farther away from the window. They will adapt to growing in a low light area, but they won’t grow as vigorously. And like I said, they will get leggy much faster without adequate lighting. If you don’t have a bright room to grow your dumb cane, then you could add a small grow light to help keep the plant from growing too leggy. It also helps to rotate the plant once and a while so it doesn’t reach toward the window (like this neglected one that was growing in my dark kitchen…oops!). Rotate the plant every time you water to help prevent it from leaning to one side as its reaching for the the light. Dumb cane houseplants aren’t super fussy about the type of soil they’re grown in. Any general purpose potting soil will work just fine. However, if you’re a person who tends to give your houseplants TOO much love in the form of water… then you’re better off using a fast draining soil mix for them. Simply add some perlite, pumice, or coarse sand to the potting soil to help with drainage. If you tend to overwater plants, make sure you grow your dumb cane in a pot that has drainage holes, and never allow the pot to soak in water. You don’t need to worry about repotting your dumb cane very often, they really don’t need to be repotted until they become pot-bound. In fact, repotting a plant just for the sake of aesthetics, or simply because you feel it should be part of your regular dieffenbachia care routine are the wrong reasons. And never repot a sick or ailing plant to try to save it. Repotting puts a lot of stress on plants, and the transplant shock may end up killing weak or unhealthy plants. So how do you know when to repot it then? One good indication that it’s time for repotting your dumb cane is if there are roots coming out of the bottom holes. Also, if there are more roots than soil in the container, or you find that you have to water it constantly to keep it from drooping. Then it’s probably time for a bigger pot. To be sure, simply slide the plant out of the pot and take a look at the roots. If very little soil is left, or the roots are circling around the bottom of the container, then it’s time to repot it. Only go up one or two sizes in pots, or the plant may have a difficult time becoming established in the new pot. For example, if you’re growing dieffenbachia in a 4″ pot, then choose a 6″ pot. Or if it’s in a 10″ pot, put it into a 12″ or 14″ pot. Always, always use a container with holes in the bottom for drainage. Learn how to repot houseplants here. Another great thing about easy-to-grow indoor plants like dumb cane is that they can grow just fine without fertilizer. But, like any houseplant, a dumb cane will definitely benefit from a being fed. I highly recommend using an organic plant fertilizer rather than chemical ones. 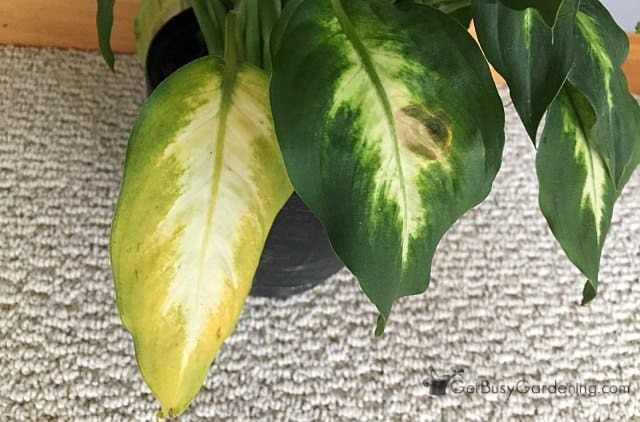 Over-feeding with synthetic fertilizers is a very common problem with dieffenbachia plants, and can lead to brown leaf edges and tips, among other issues. I like using compost fertilizer, which you can get in liquid form or buy compost tea bags and brew your own. You can also give your plant a foliar spray using compost tea. Just put it in a spray bottle and mist the leaves of the plant – they will love the added humidity too! Other organic fertilizers that I like using are this houseplant fertilizer or a general purpose plant food. Only feed your plant in the spring or summer (during their active growing season). They go into a dormant state during winter, so it’s best to let them rest. It’s rare for a healthy dumb cane houseplant to have problems with bugs, but sometimes insect pests like spider mites, thrips or mealybugs can attack the plant. If you notice webbing on the leaves or leaf joints, those are spider mites. Mealybugs look like white cotton on the plant, and thrips are tiny bugs with arrow shaped black bodies. If you find bugs on your dieffenbachia, then start treating the plant right away using organic pest control methods. Never use chemical pesticides on indoor plant bugs because they can build up a resistance to chemicals, making problem even worse. My favorite product to use is organic neem oil. It’s s a natural insecticide that is very effective at controlling houseplant bugs. Horticultural oil works great too. A soapy water spray is also very good for controlling most types of bugs. I use a mixture of 1 tsp mild liquid soap per 1 liter of water. If you don’t want to mix your own, you can buy an organic insecticidal soap spray. Learn all about how to get rid of houseplant bugs naturally here. Brown or yellow leaves can be removed from the plant at any time, as can dead or faded flower. Simply cut them back all the way down to the main stem. You can also prune brown leaf tips and edges as necessary, following the natural shape of the leaf. To keep dieffenbachia from growing leggy, pinch or prune out the new growth at the top regularly. Pruning out new top growth like this will encourage your plant to grow bushier, and stay more compact. If your dumb cane has grown tall and leggy, you can top the plant, or cut it back anywhere on the stem. New leaves will grow just below the place you made the cut. You can even keep the top and root the stem to grow yourself a new plant (learn how to propagate dieffenbachia in the section below). Dumb canes can be propagated by either rooting stem cuttings or by division. If there are several stems growing in the pot, you can separate them to grow new plants. Just be sure that each stem has roots before potting them up, otherwise they may not survive on their own. Rooting dieffenbachia cuttings can be a bit tricky. The key is to keep the soil moist but never soggy, and give the cutting lots of humidity. You’ll definitely want to dust the cut end with rooting hormone before attempting to root it. And be sure to use a fast draining soilless mix for rooting cuttings, rather than regular potting soil. Personally, I’ve had the best success using my propagation box for rooting dumb cane cuttings. But you could try putting a plastic bag over the cutting to help give it enough humidity (just never allow the bag to touch the leaves). I’ve also heard of people successfully rooting dieffenbachia in water, though I’ve never tried it myself. If you want to try rooting your cuttings this way, make sure the stem is several inches long. Place the stems into a vase of fresh room-temperature water. Then keep the water fresh as you wait for the roots to grow. Yellowing leaves – It’s normal for the lower leaves to turn yellow or brown, and eventually die. Simply trim them off as needed. However, if there are several yellow leaves, and they aren’t all on the bottom, then there’s something else wrong. It could be caused by overwatering, insufficient light, pot-bound roots, or bugs (spider mites or thrips are the likely culprits). Brown leaf tips and edges – Brown leaf edges and tips could be caused by inconsistent watering, low humidity, too much fertilizer, or salt/mineral buildup in the soil from tap water. Crusty buildup on the top of the soil or around the pots edge are signs of over-feeding or too much salt/minerals from tap water. Switch to using organic fertilizer, and use filtered water or rainwater instead of tap water. Drooping leaves – Drooping is usually caused by over or under watering, but it could also be from exposure to cold or hot air, plant bugs, or transplant shock after repotting. 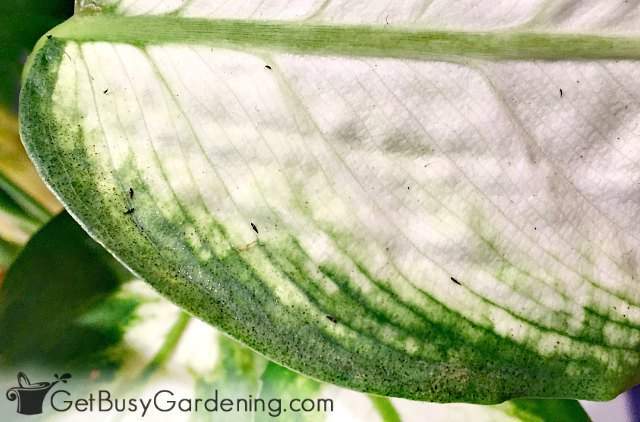 Curling leaves – Curling dieffenbachia leaves are usually caused by spider mites or other types of pests, but could also be caused by excess fertilizer, under watering, or extreme temperature changes (like cold or hot drafts). Stunted, small new leaves – Small, stunted new leaves are usually the first sign of a pest infestation (most likely mealybugs or spider mites). Over-fertilizing or improper watering are also a common causes. However, in some cases it could be due to the plant being pot-bound, or sometimes even root rot. Yellow stem – A yellow stem can be caused by overwatering, over or under fertilizing, pot-bound roots, or something more serious like root rot or stem rot. Slide the plant out of the pot to inspect the roots for signs of rot. If the top of the stem is yellow, you can prune it off using a sterile knife or clippers. Leggy dieffenbachia – Legginess is the natural growth habit for this plant, dieffenbachia normally grow leggy over time. But it can be made worse if your plant isn’t getting enough light, so move it to a brighter location. You can also prune your plant regularly to encourage bushier growth. In this section, I’ll answer the most frequently asked questions I get about proper dieffenbachia care. If you can’t find the answer you’re looking for after reading through the post and these FAQs, then ask your question in the comments below, and I’ll answer it as soon as I can. It’s normal for the bottom leaves to turn yellow, and eventually die and drop off. Though annoying, that’s the normal growth pattern of this type of plant. However, if several leaves are yellowing at the same time, or they aren’t the bottom leaves, then something may be wrong. Refer to the troubleshooting list above to help you figure it out. The most common causes of dumb cane drooping are over or under watering, exposure to hot or cold drafty air, houseplant bugs, or transplant shock. See to the “Troubleshooting Common Dieffenbachia Problems” section above for more details. Rather than watering your plant on a set schedule, you should always check the soil to figure out when it needs water. Check it every few weeks by sticking your finger about 1″ into the soil. If it no longer feels damp, then it’s time to water. See the “Dieffenbachia Watering Instructions” section above for details about watering dumb canes. Yes, and you should make it part of your normal dieffenbachia care routine. The stem will grow new leaves right below the cut. See my “Dieffenbachia Pruning Tips” above to learn how to cut back a dieffenbachia. Plus, you can take the cutting and root it to make a new plant! If you want to learn how to root a dieffenbachia plant, see the details in the section called “Dieffenbachia Propagation Methods”. Brown tips and leaf edges could be caused by inconsistent watering, dry air, overuse of chemical fertilizer, or minerals in tap water. The list under “Troubleshooting Common Dieffenbachia Problems” will give you more ideas and details about fixing common dieffenbachia plant care problems. Yes! So if you choose to grow this plant, then be sure to keep it out of reach of children and pets. 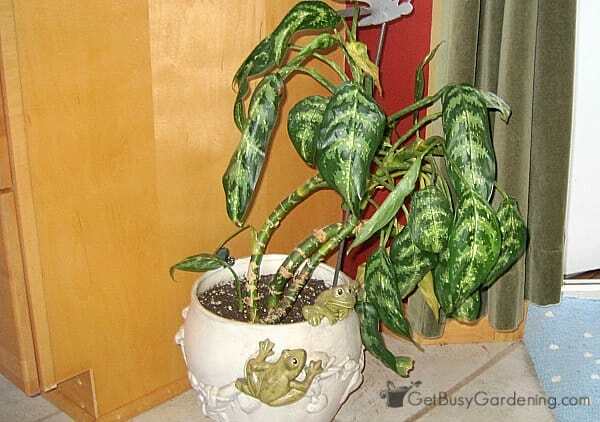 See “Are Dieffenbachia Plants Poisonous?” above for more information. Since they are very common indoor plants, you should be able to find dieffenbachia plants for sale at your local garden center any time of the year. But, usually you’ll find the best selection of houseplants during the fall and winter months. Of course, you can find dieffenbachia for sale online any time during the year. Dieffenbachia care may seem a bit overwhelming at first. But don’t worry, you’ll get the hang of it in no time! And now that you know how to take care of dieffenbachia, you’ll be able to grow these gorgeous houseplants for years to come! If you’re tired of watching your houseplant suffer to stay alive through the long, dark winter months, then my Winter Houseplant Care eBook is for you! It will show you how to keep your indoor plants alive and thriving all year long! Download your copy today! Share your dieffenbachia care tips in the comments section below. i wish mine were so pretty, but I asume I have to plant several in the same pot? mine are leggy and not have so much leaves. It’s very common for dumb cane houseplants to grow tall and leggy over time, especially when they aren’t getting enough light. To grow their best, they need bright indirect light. If you want to try pruning your dumb cane plant to make it grow bushier, then you can just pinch out the tops of the new growth, and it will encourage the plant to branch out at the top. Or, if you’re really brave, you can cut the stem of the plant several inches below where the bottom leaves are growing and try propagating the cuttings. The stem should grow new leaves just below the cut too. the new leaves on my dumb cane are not opening…….. Sorry to hear it. It’s hard to diagnose the problem with your dumb cane without more information. What do the leaves that aren’t opening look like? Are they brown or yellow? Does the plant seem to be suffering in any other way? Have you checked for bugs? Also my problem, new leaves or sprouts are both yellow and brown. I have searched in vain for an answer. No bugs, no over watering, has humidity and low light, no over fertilize. I have virtually nothing left to do….but watch its death. Stunted new leaves like you describe are usually caused by over fertilizing, or bugs like spider mites (which are super tiny and easily overlooked). But if you’re sure there is absolutely nothing else wrong with your dumb cane plant, then it may have some kind of a disease. I would try pruning off the leaves that won’t open, and see if that triggers new growth. I am expirencing the problem of your last example of the dieffenbachia leaves turning yellow,driving me crazy. empty store no one has watered these plants for months and they are not in direct sunlight and they are thriving one is at least five feet tall and well rounded.trying to save my plant the Diffs are so beautiful. My plant has both small yellow leaves but a lot of the leaves are still green but just real limp and droopy. Just hanging downward and stems that were upright are now leaning off in different directions. We recently moved and had no problems it was by a window with filtered light. I now have it by sliding door which does not open same kind of light so I don’t understand. Why is my dieffenbachia drooping? What about AC in bedrooms, does it harm the dubm cane plant too? Great question! It could if your plant is sitting right next to or on top of where the cold air is coming out. I would definitely recommend you keeping your dumb cane away from the cold air coming out of your A/C unit. Hey there! I am currently experiencing mine being droopy, not sure if It needs to have more soil added, plant food or what I am doing wrong with it. When dieffenbachia leaves droops, that usually means it’s either being over watered or under watered. The first thing to do is check the soil by sticking your finger one inch deep. If it’s wet, then let it dry out more between waterings. If the soil is totally dry, then give your dumb cane a good watering, and try to water it a bit more often. An inexpensive soil moisture gauge is a nice tool to help make sure you’re watering your dumb cane plant properly. If the soil level on the pot is really low, then you can certainly top it off with fresh soil, that won’t hurt anything. But I definitely would not recommend fertilizing it until after you figure out why it’s drooping. Fertilizing an already stressed plant can be fatal to the plant. Good luck! We have a dumb cane at work that is huge and beautiful, our problem is it’s almost to the ceiling and falling over. My question is can we just top it off?? We have replanted it in as deep a pot as we can find so the only option I see is to let it lean which is not pretty or cut the top house out if the middle?? Yes, you can top a dumb cane, and it will grow back from just below the cut. Then you can root the cutting for a new plant if you want to. If there’s no growth below where you plant to make your cut, it can be a bit risky. But if you propagate the cutting, then you won’t have worry if the bottom half survives. 🙂 Also, be sure to use a sharp and sterile knife or pair of clippers to make the cut. My dumb cane Is about 2 ft tall. I moved into a new house and the climate is more warm. The leaves on my plant are as perky as they used to be. What could be the cause of the droopy-ness? Your dumb cane may just be in shock after the move. Plants don’t like to be moved, and it can take some time for them to get used to their new environment. The best thing to do is to leave it alone until it recovers. Our dumb can has leaves that start to dry out and turn brown. Something we then also have leaves that turn yellow. I would think maybe I’m over watering but don’t understand why domes leaves would be drying up. It’s in an area that gets afternoon light away from the window. Thanks! There are a few things that could cause dried up brown leaves on dieffenbachia plants – too much fertilizer, not enough water, or the air is too dry (it needs more humidity). Yellow leaves at the bottom of the plant are normal. As the lower leaves age, they naturally turn yellow, and will usually eventually drop from the plant. Great post, thank you for all these informations! I have a problem with my diff too: when I took it home from the store it was all big and bushy then we had a spider mites attack, but it seemed like this plant we saved in time. Later I discovered a big whole in one of the stems so I repotted, taking that one stem away (Looked like something bit into it, or was simply rotting from inside out. Didnt really find out what it was, just dealt with the problem). Since then, it’s doing okay but not great… the lower leaves slowly turning yellow and die. I thought its some sort of bugs on the leaf but it really looks like just dirt . Some of the leaves on the top have brown edges but I think thats pretty normal – of course would be better without:) – but also due to the really hard tap water we have in Berlin. I try to let the water sit since and water the plants with that. Also, while the lower dieffenbachia leaves yellow and die (I cut them before they fall) there are some new leaves coming up, that are super curled up and also oddly looking. You’re welcome! It’s normal for the lower leaves on dumb canes to turn yellow and eventually die. 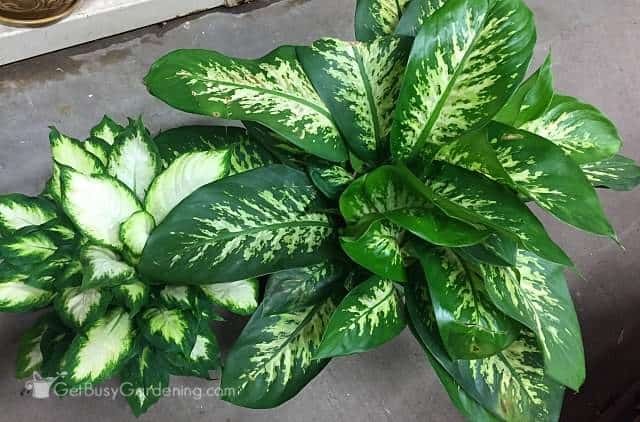 However, if you’re concerned about it, read the section “Troubleshooting Common Dieffenbachia Problems” above for more ideas for what could be causing the yellow leaves. The brown edges could be caused by inconsistent watering, over-fertilizing, or maybe even the type of water you’re using. I collect rainwater (or melt snow in the winter) to water my houseplants, and they love it! 😉 You could use filtered water on them instead. As for the new growth… it’s normal for the new dieffenbachia leaves to be curled and look a bit odd as they open. If they look green and healthy, and aren’t brown or yellow, then there’s no reason for concern. Overnight, leaves on my plant suddenly, at the tip end, turn a funny brownish color and fill with fluid…like a blister! If you touch it, it pops and stinky fluid comes out. What is causing this?? Oh my goodness, that sounds gross! I would check the space where you have it and make sure it’s not near a heat source or a freezing cold window that could have damaged your dieffenbachia and caused the blisters. Since it happened that quickly, I suspect the leaves either froze or were somehow burned. I would also inspect the leaves to see if there are any signs of bugs that could be causing the blisters. My Dumb cane plant has grown 6 feet tall with the being 18 inches long and 10 inches wide. The problem is it is top heavy and the pot fell over. I cut the cane to place in another pot I left the cane at 4 feet. By putting the top heavy plant will it continue to grow. Currently it looks like it is in shock. Is there anything I can do to help it to come out of shock. The plant is really healthy. Yes, new growth should start just below the spot where you cut the cane. It may take a little while for your dumb cane to start growing again after topping it like that. Just treat it like you normally would during this time, and it should start putting on new leaves in no time. I left my plant outside for a few nights and now most of the leaves are turning yellow yes it did get a bit cold outside what can I do to help it get green again? Do I cut most of the leafs off? The stems are still green and heathy. I also haven’t watered it because it had to much water which I poored out. Help I’ve had this plant for many years. Love it. Oh no! Sorry to hear that your dieffenbachia got frost bite! I would definitely not recommend cutting off all of the leaves right away. Let it sit for a while to see how bad the damage it. The leaves that were frozen will likely turn brown or black. After a week or so, I would prune off the brown and black parts of the leaves, but leave the yellow ones on there for now. Once you start to see healthy new growth, you can begin pruning off the yellow leaves. When the new leaves are small like that, then it can either be caused by houseplant pests, improper watering, or using too much fertilizer. However, since you mentioned that the stem is also spindly at the base, then my guess is that it’s being overwatered. Check the soil and make sure it’s not too wet, and also make sure the stems aren’t rotting at the base. 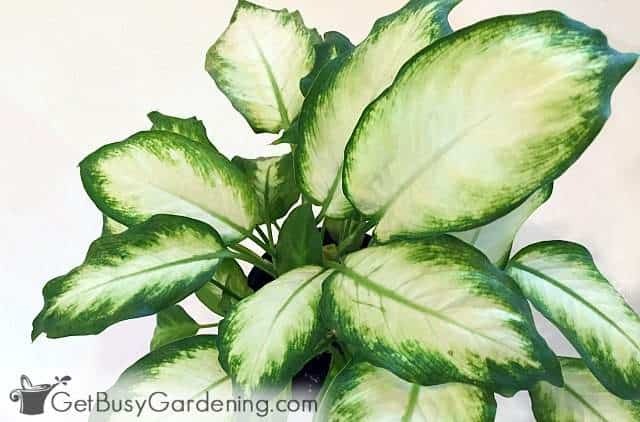 See the “Troubleshoot Common Dieffenbachia Problems” section above for more details, and also be sure to read the section titled “Dieffenbachia Watering Instructions”. My issue is mine is growing very slowly. Its leaves have stayed fairly small, and it has been really slow to get additional leaves. Could it just be it needs a deeper pot or dusting off leaves more often? It has the tiniest bit of brown at the ends of the leaves, but otherwise it looks healthy. It is right by a north facing window, getting lots of indirect light. It sounds like a very happy plant to me. Don’t worry, dieffenbachias don’t grow very fast. A north facing window doesn’t give a lot of light, so you could move it to a brighter room if you want. But as long as it’s healthy, and not reaching for light, then I think it’s fine. My cane keeps growing sideways and twisty, until it cant keep standing with the weight, flops over, and keeps growing into twists. There are four or so big stems that do this. The middle of the plant is many little stems that can’t seem to hold their own weight at all. Do you have an idea on how I can get it to grow up rather than out? Yes, it’s common for dieffenbachias to get top heavy like that as they grow tall and leggy. You can try staking your dumb cane in order to get it to stay upright. Otherwise, you could try topping it and propagating the cuttings to make new plants. As for the smaller stems you describe, it sounds like maybe your plant isn’t getting enough light. I would try moving it to a brighter location and see if that helps to keep it from continuing to grow so leggy.